This is an unbuilt kit for an Off-Air Frequency Standard from Spectrum Communications. It is a crystal calibrator phase locked to BBC Radio 4 on 198kHz with an output of 2V peak to peak at 10MHz. I got this with the intention of using it to frequency lock my Elecraft K3 using the KREF3 module. Regular readers may remember that last year I purchased a surplus Efratom LPRO-101 rubidium frequency standard to calibrate my radios. But a rubidium frequency standard has a finite life which will be used up very quickly if it is turned on all day to use as a real-time frequency reference. My intention is that the off-air frequency standard will run all day and keep my K3 as accurate as I need it to be. I ordered the full kit from Spectrum. I was disappointed to find that what looked like a die cast box in the picture is actually a plastic box with a grey metallic finish. 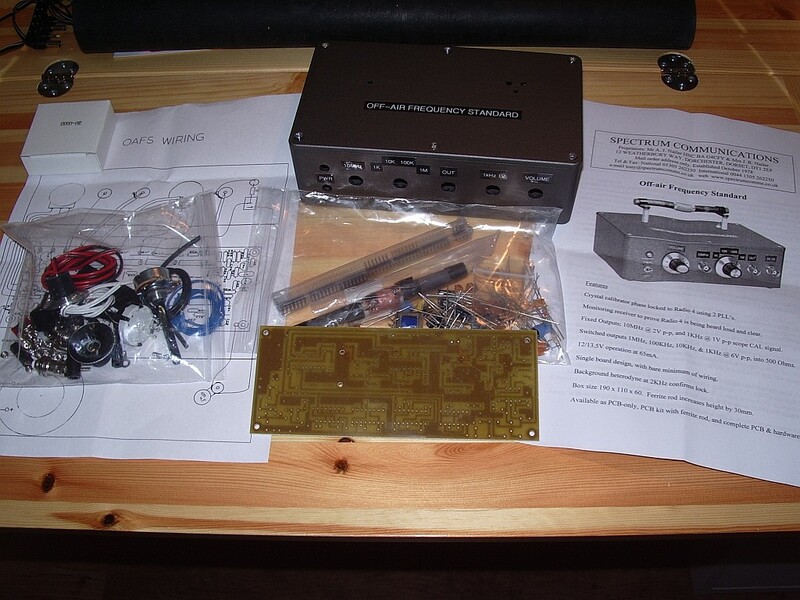 If I had realized it was not a die cast box I would probably have opted for the cheaper PCB kit and ordered one of the nice extruded aluminium alloy Hammond cases for the project. I hope it will be RF-proof enough to work in my shack environment where up to 100W may be used into indoor antennas. The other disappointment was the rather home made looking PCB which does not have a silk screened component overlay. There is a printed layout in the instruction sheet but relating the component positions to the holes on the PCB is easier said than done. My initial thought was that I am not going to be able to build this. What I will have to do is draw the component overlay on to the PCB itself prior to construction. But it isn't easy with my diminishing eyesight and need to use different strength lenses which makes switching between things at different distances a real trial. Having a silk screened PCB would just have made things a bit easier. I think my days of kit building are definitely numbered. Interesting, but do you trust that BBC will keep transmitting their long wave signals on 198 kHz (I think you mean that altough it says MHz)? Won't medium/long wave transmissions eventually disappear as DAB takes over for radio? That's what we are seeing in Norway. Correct, it should have been 198kHz. Certainly there is no guarantee that long wave transmissions will continue forever but there is a lot of resistance to DAB in the UK. There are parts of the UK that cannot get BBC Radio 4 on DAB and that also applies to boats who use it to receive the shipping forecast. Plus the 198kHz broadcast contains time signals that are used by types of electricity meter. So I think there is a fair chance that long wave signals will be around as long as I am. It will be interesting to find out whether you experience any performance issues with the OAFS once you have completed it due to the fact that you are quite close to the "mush" area caused by overlapping coverage of the Droitwich 198kHz service and the Westerglen one. The area of total "mush" is around Ecclefechan/Lockerbie, but North Cumbria is generally regarded as not being very well covered, hence the reason for the low power "filler" medium wave station in Carlisle. I have experienced problems myself with similar devices for this reason. You are of course very close to the 60kHz time signal transmitter at Anthorn which some people in the south of England complain about not receiving as well as the old Rugby transmitter! I have one of these sitting on the bench - stuffing the PCB wasn't a problem but wiring all the connections inside the box wasn't much fun. Here in France I can receive Radio 4 LW on various radios without any problem but that's not the case with the OAFS - the signal is weak and the lack of filtering means that it is swamped by the emissions of France Inter 30kHz LF. For me therefore, the OAFS is unusable; I would be interested to hear if you have similar problems given that you are appaently in a marginal reception area for Radio 4 LW.